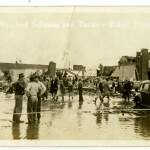 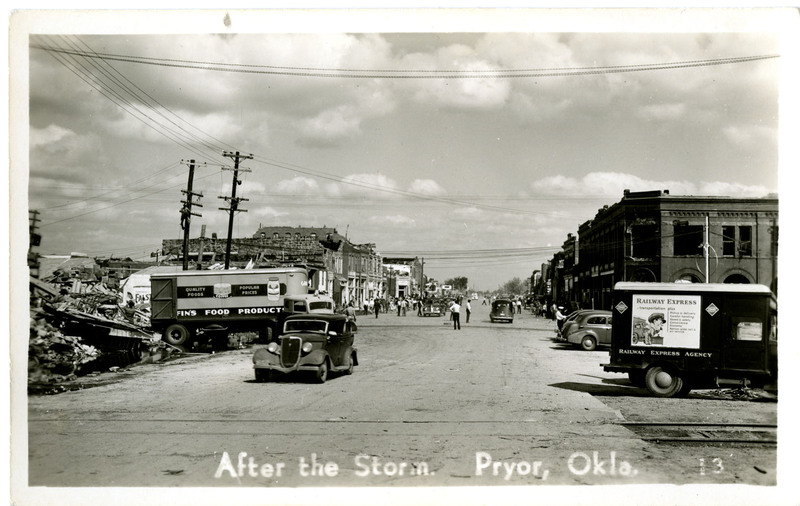 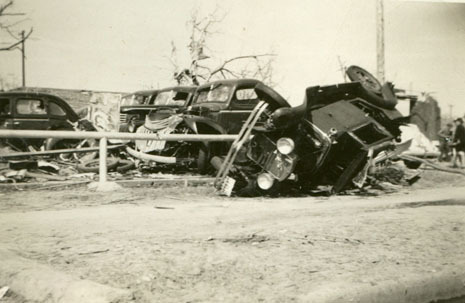 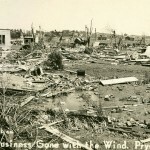 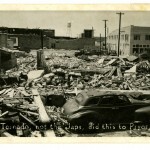 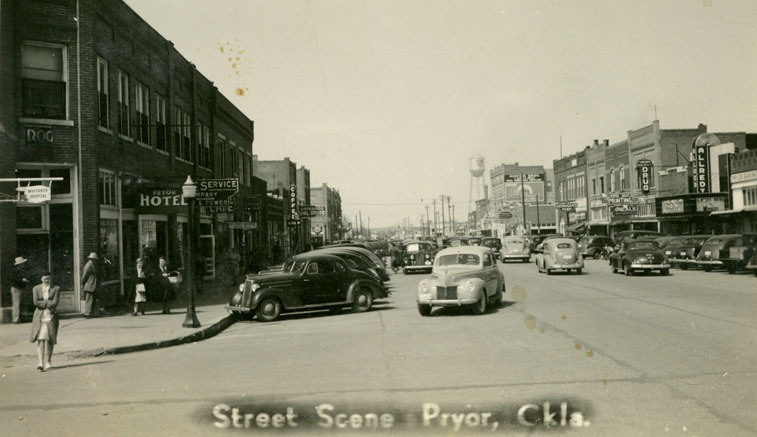 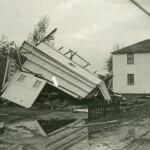 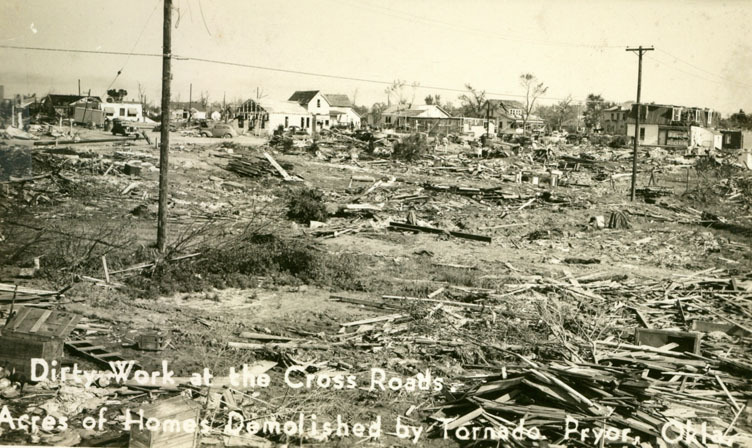 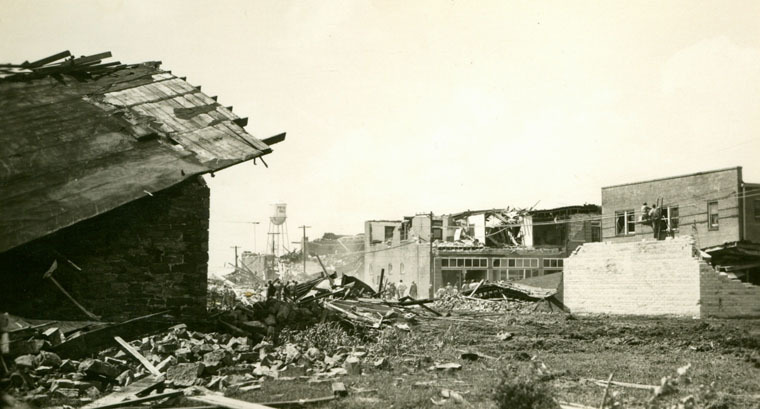 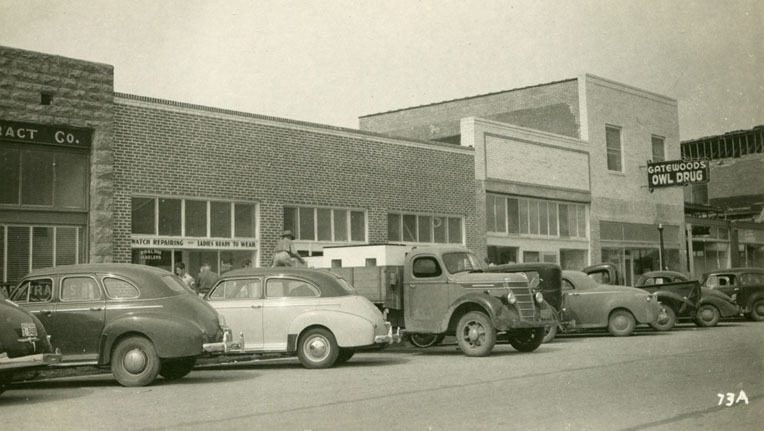 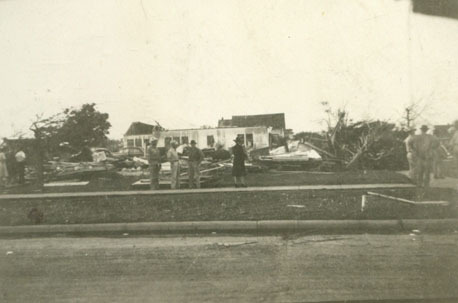 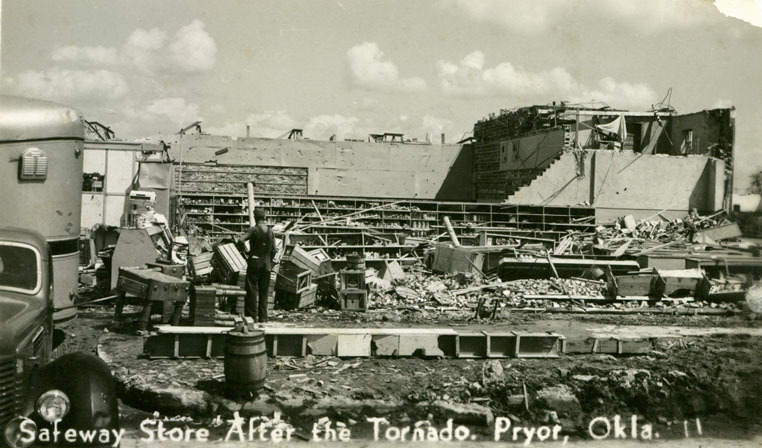 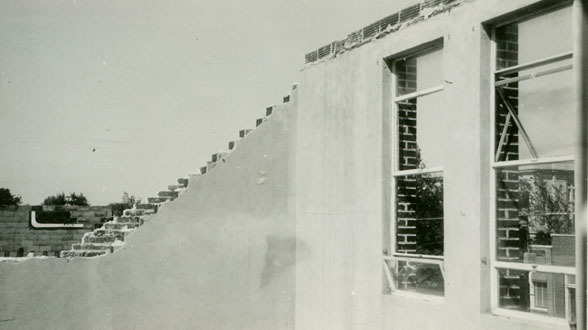 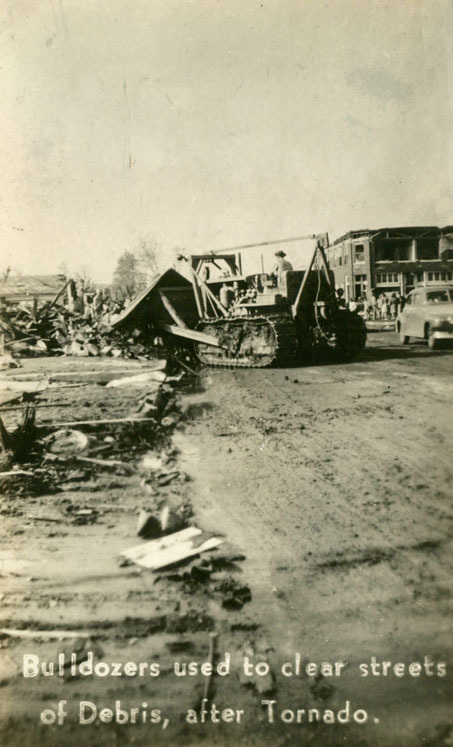 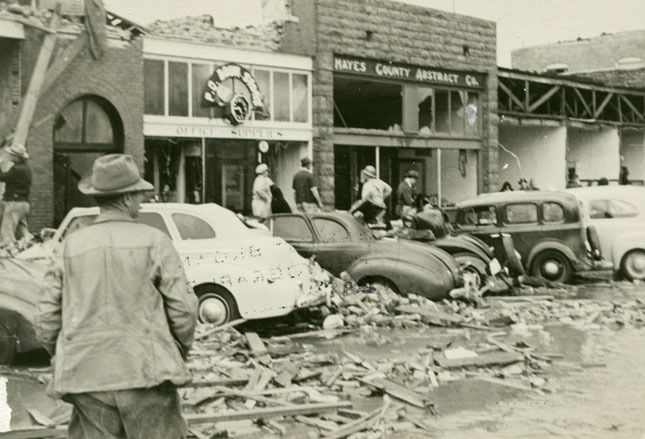 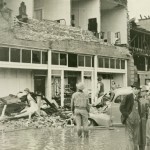 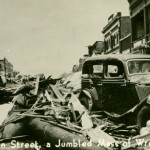 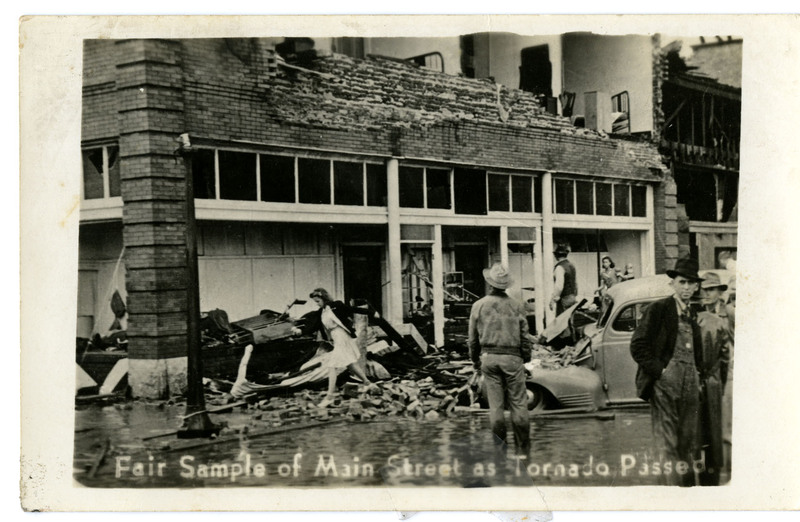 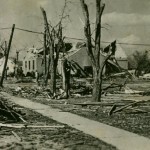 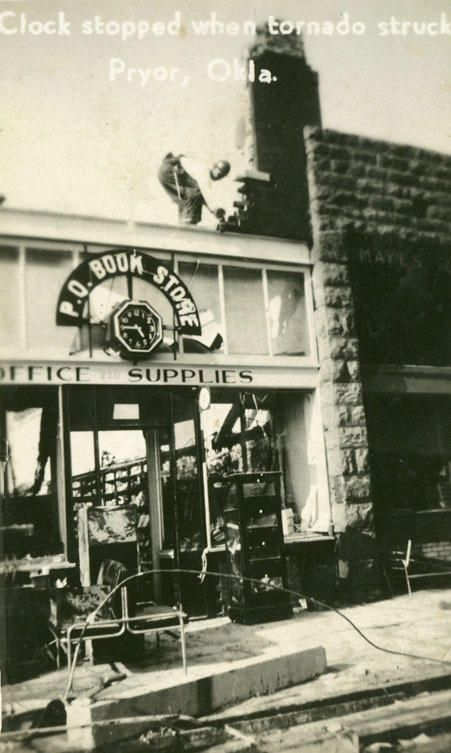 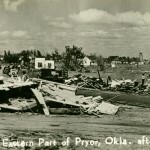 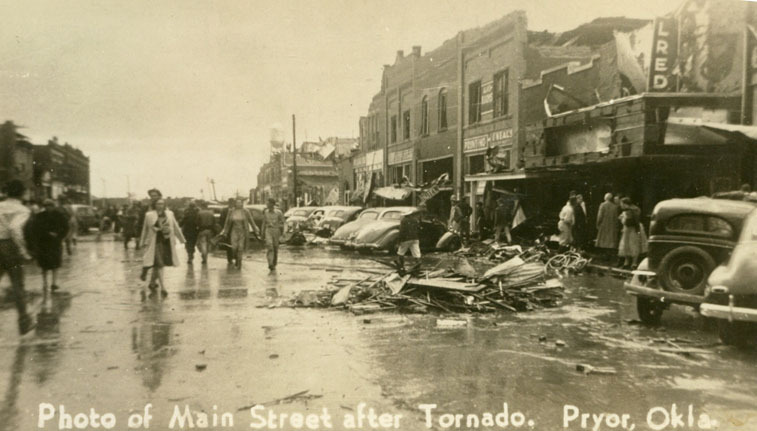 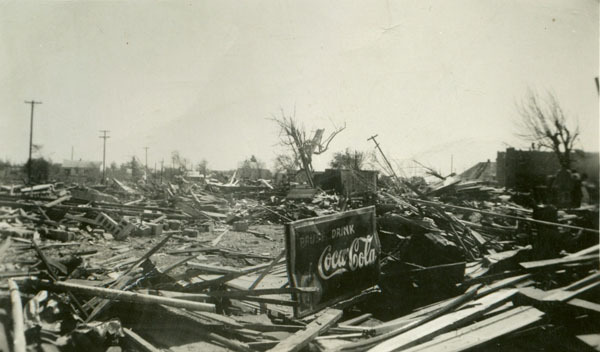 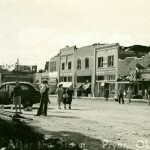 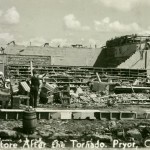 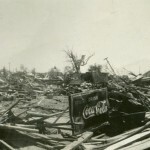 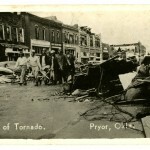 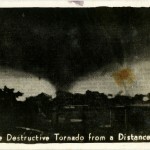 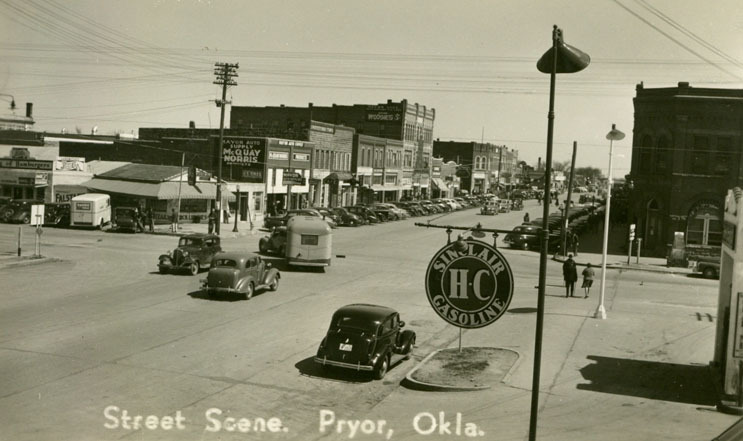 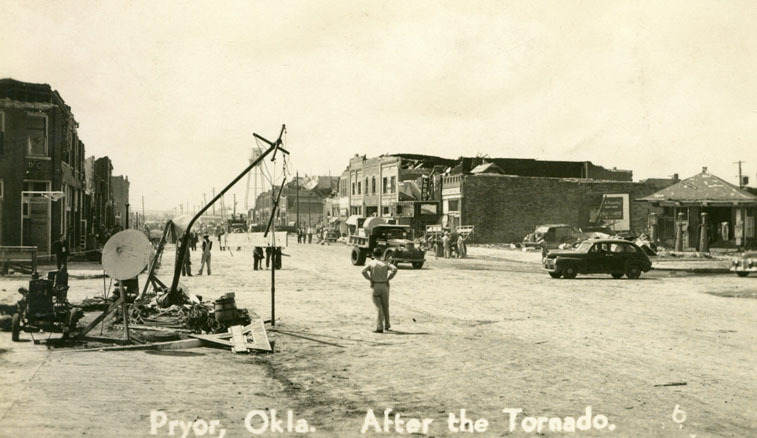 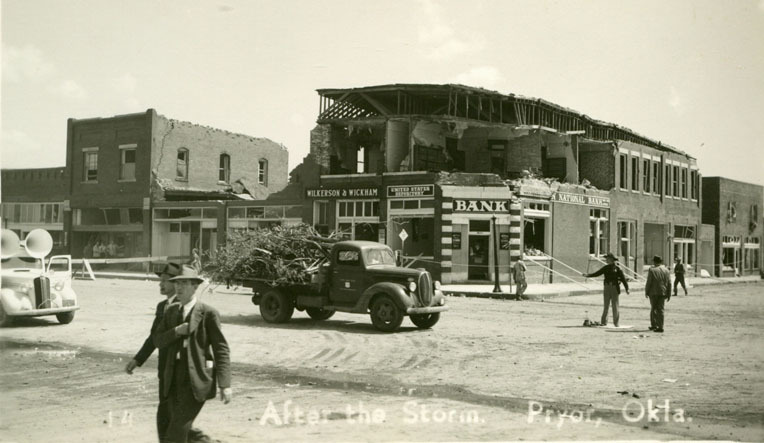 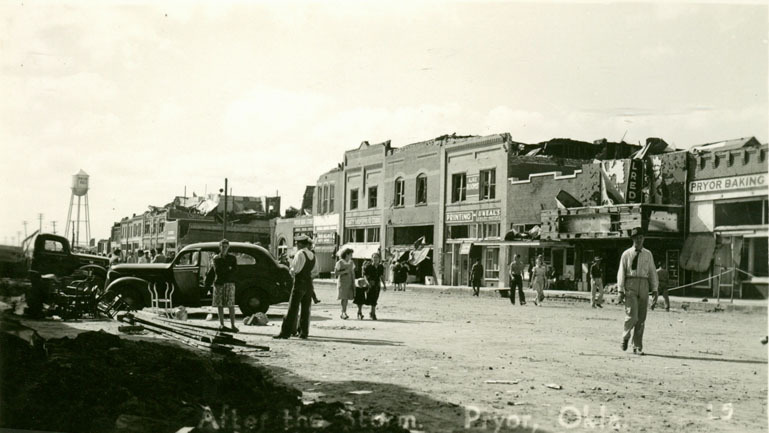 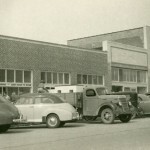 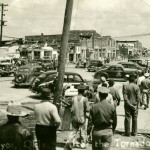 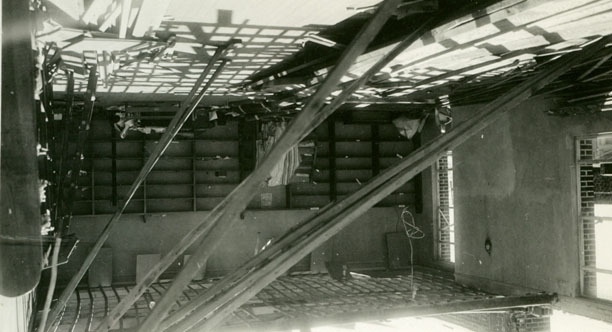 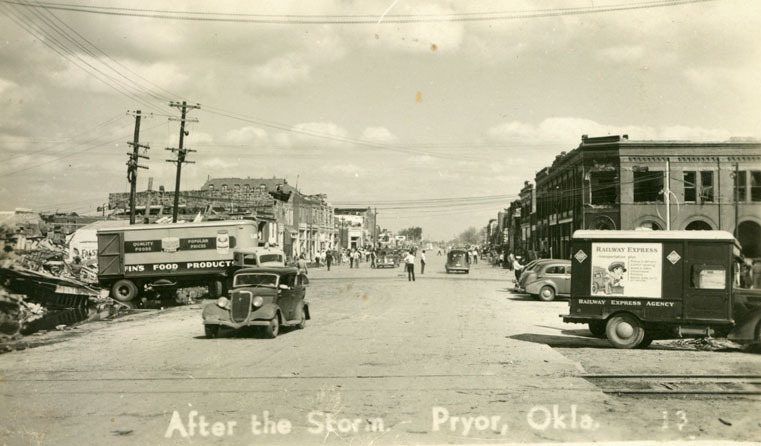 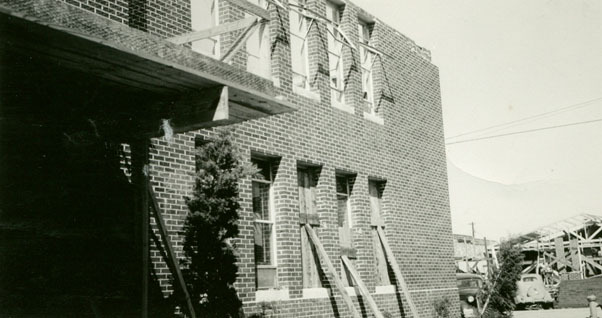 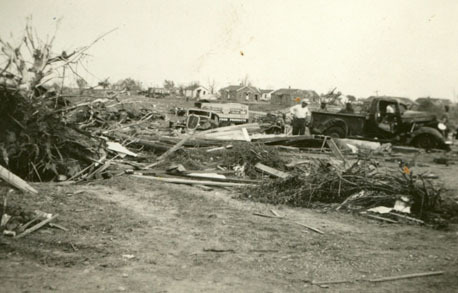 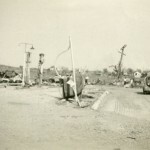 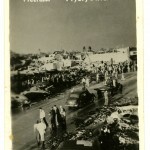 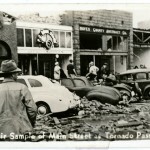 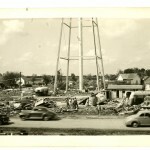 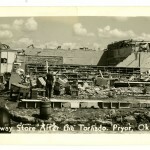 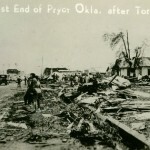 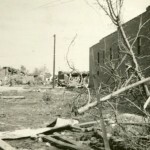 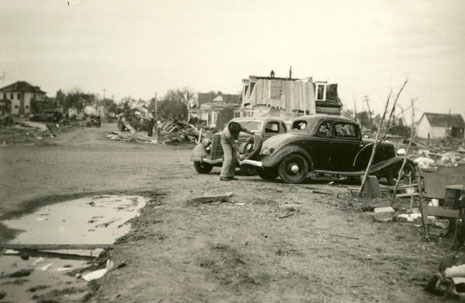 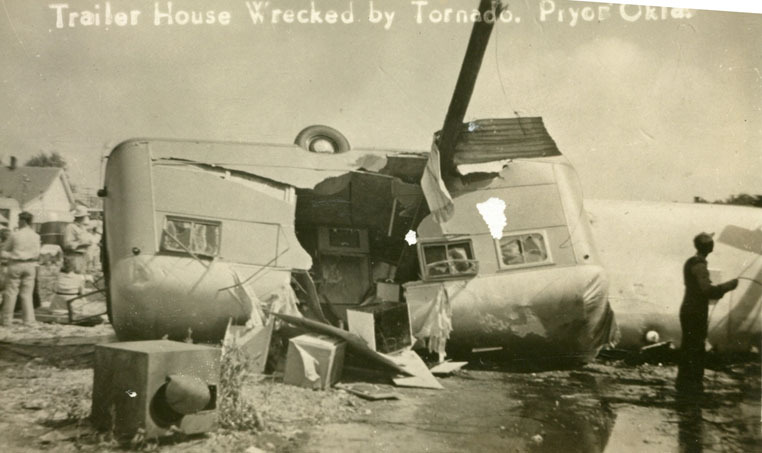 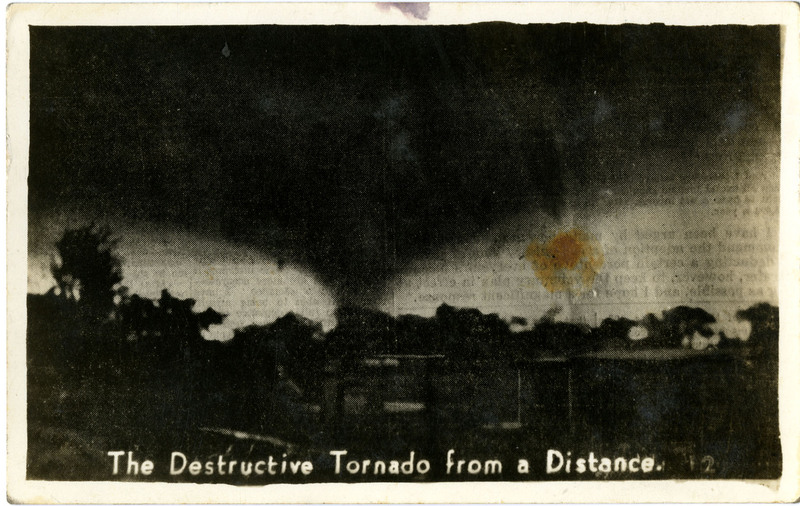 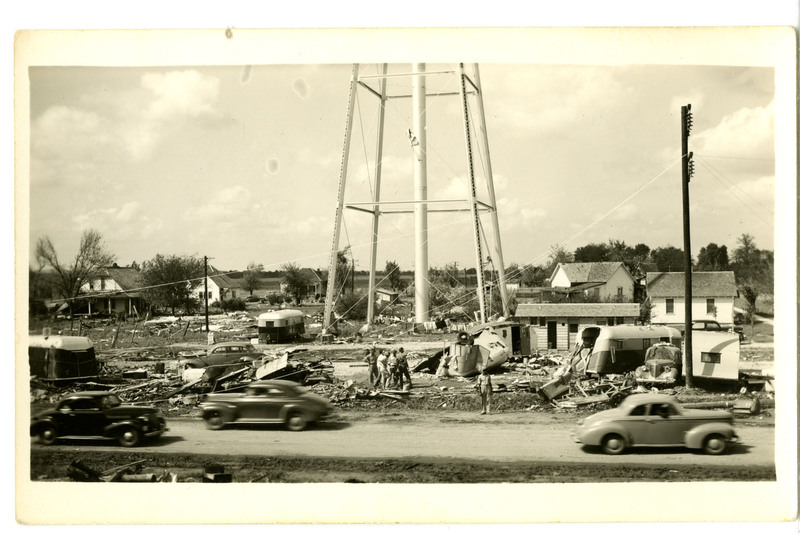 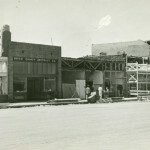 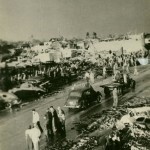 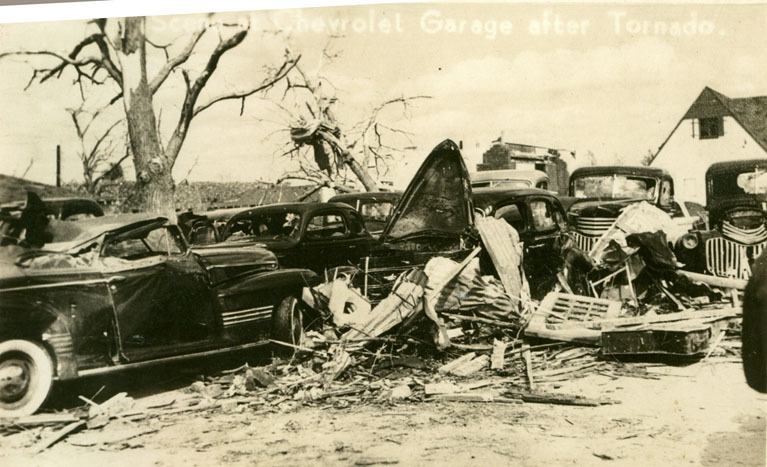 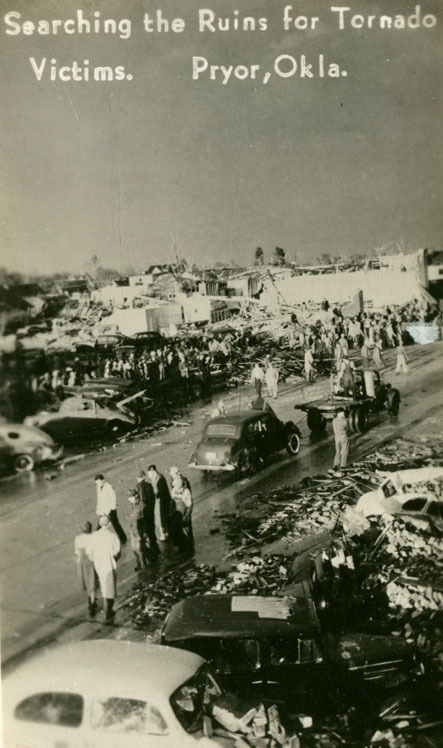 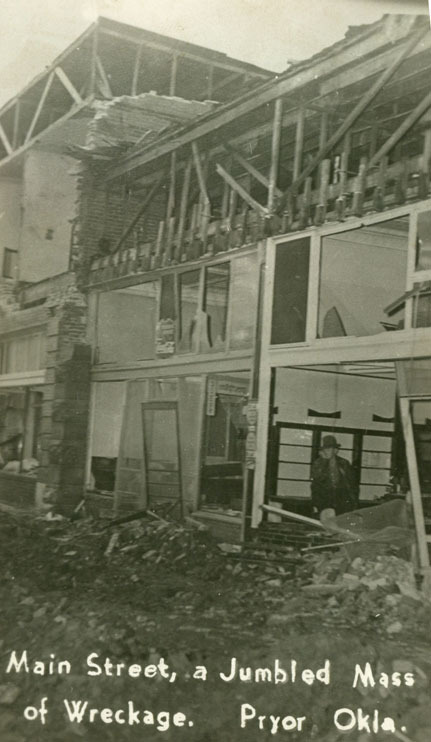 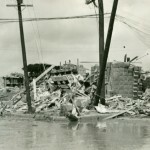 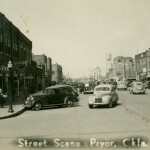 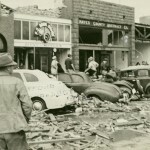 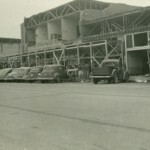 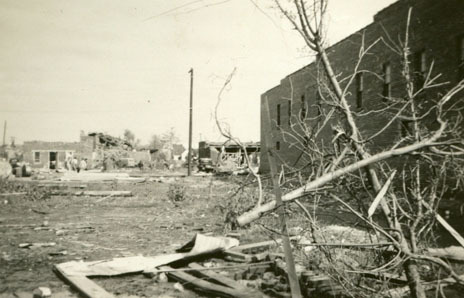 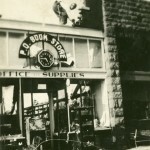 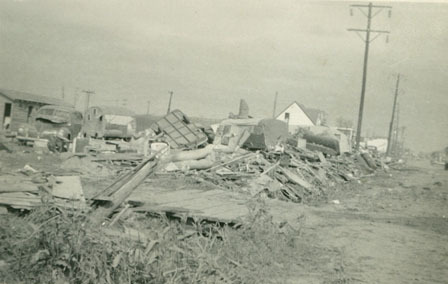 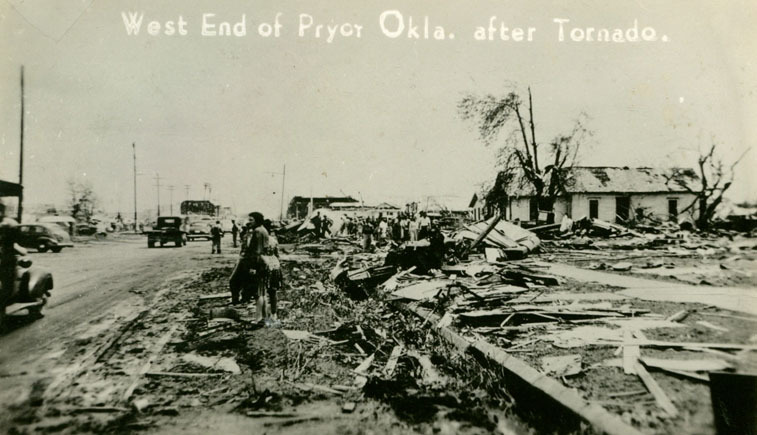 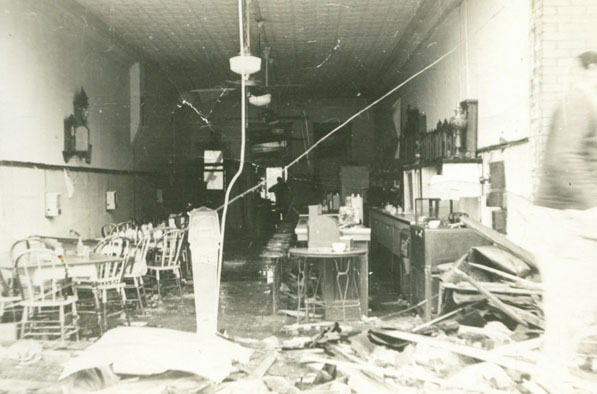 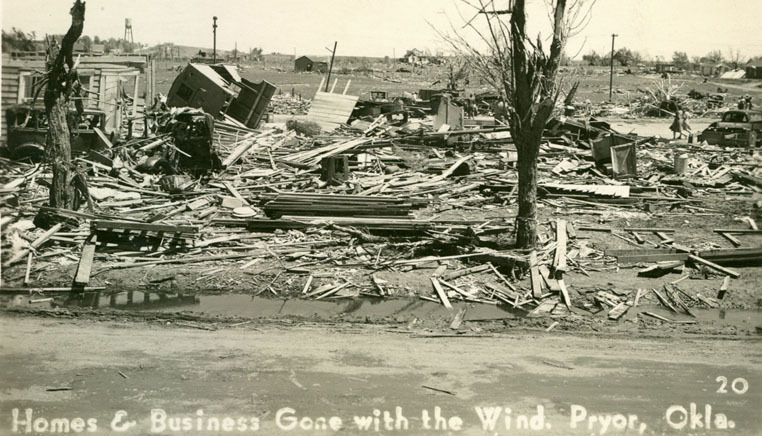 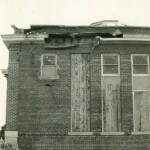 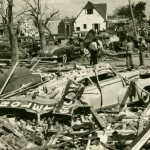 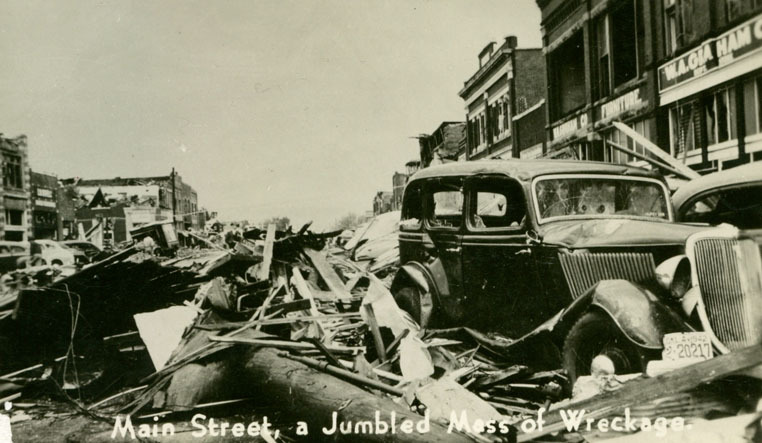 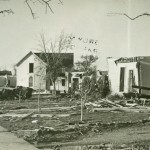 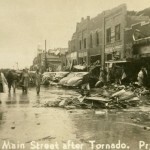 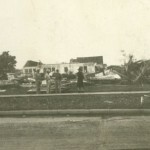 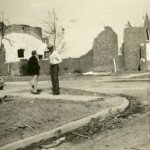 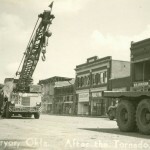 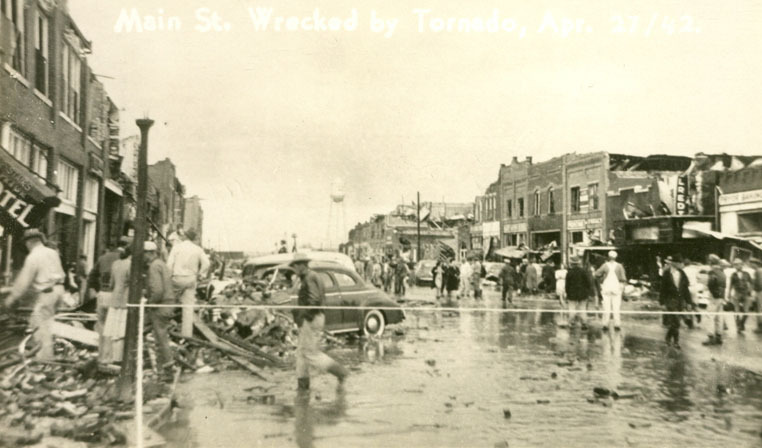 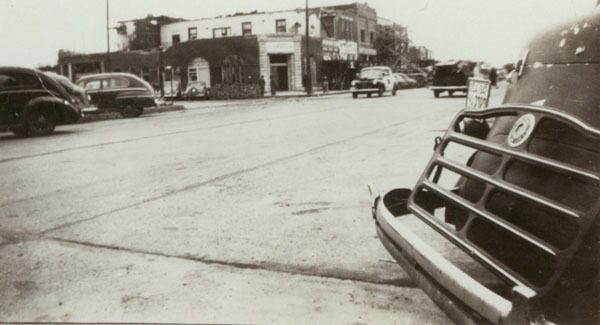 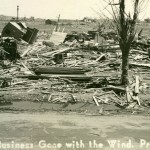 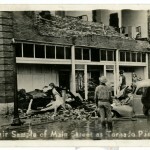 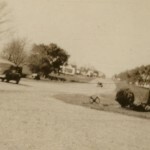 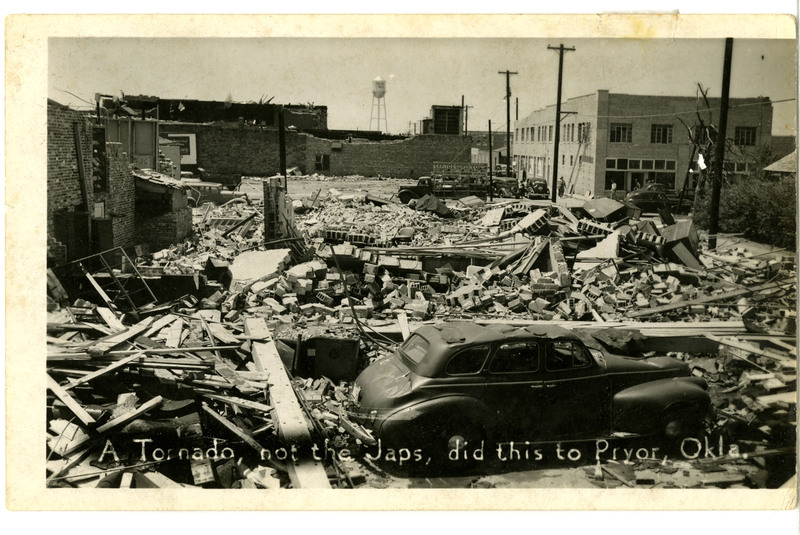 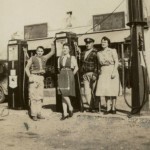 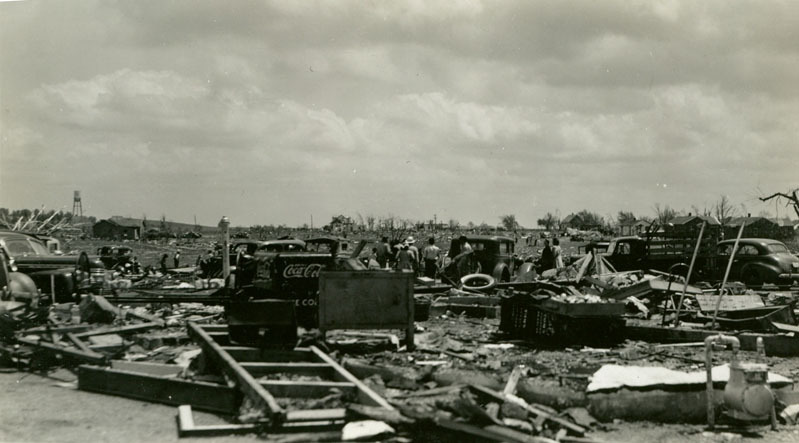 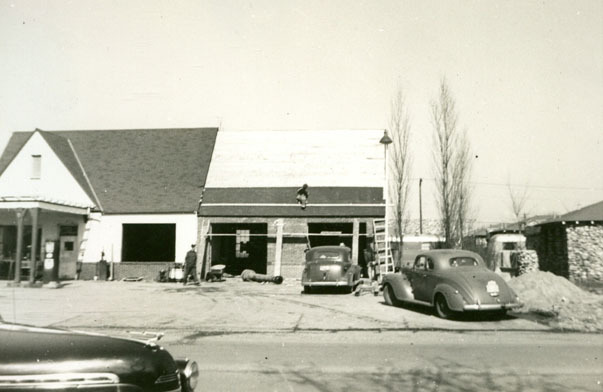 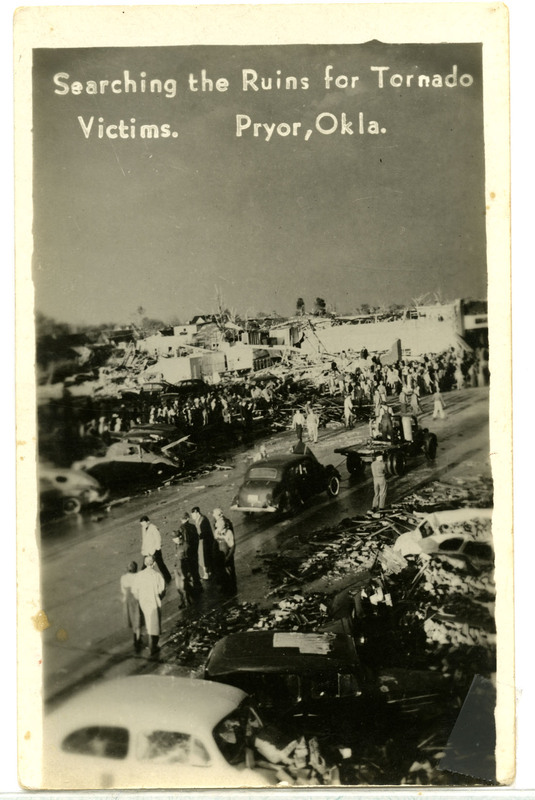 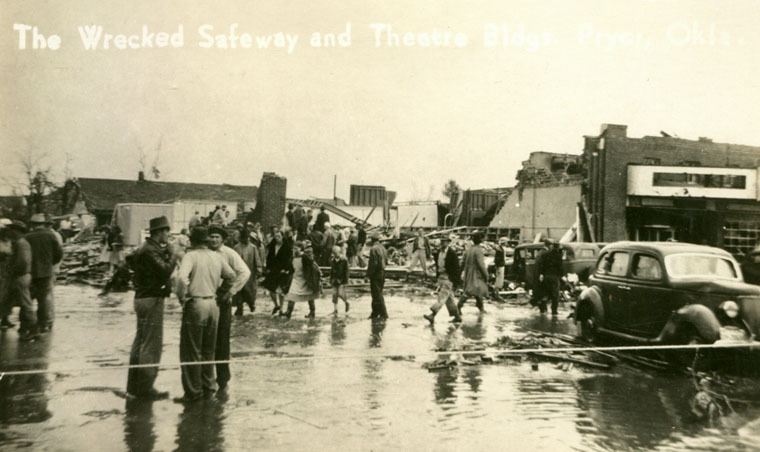 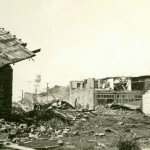 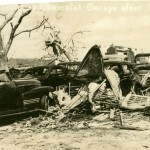 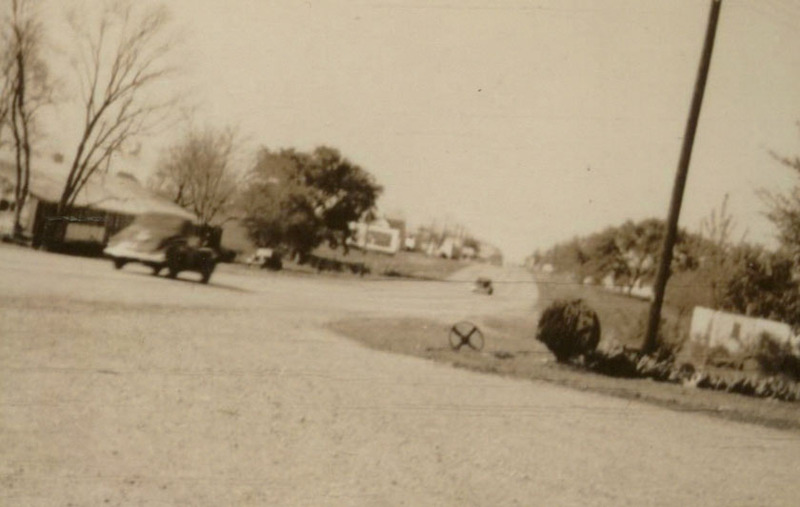 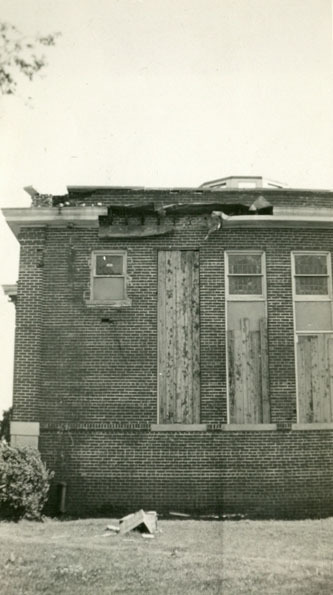 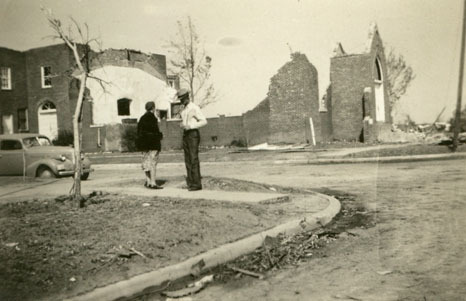 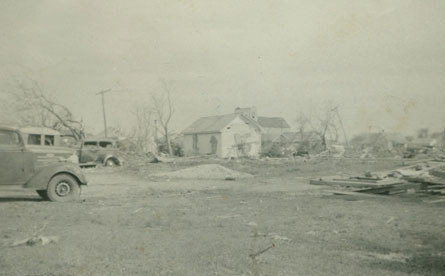 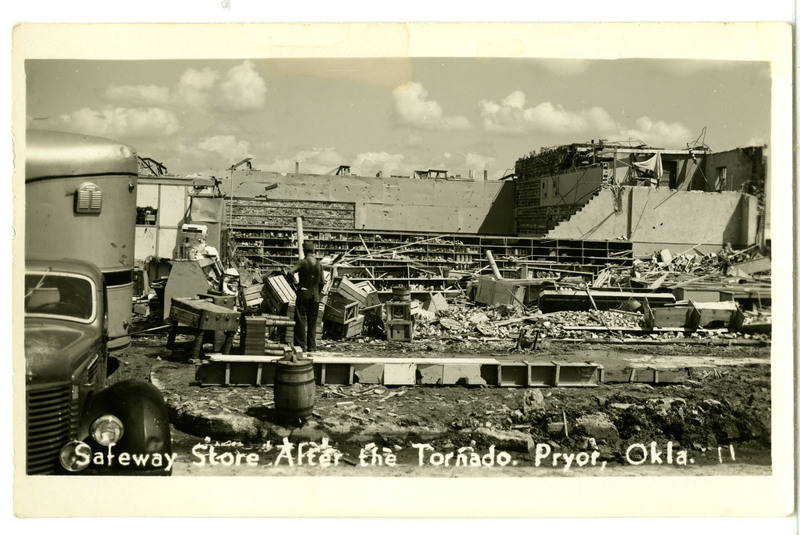 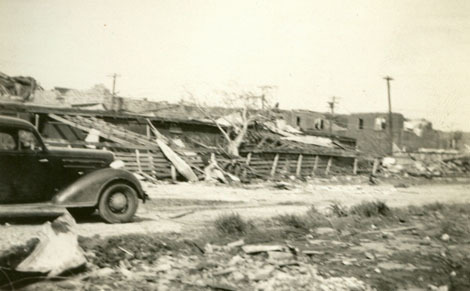 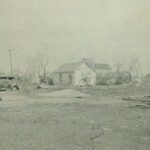 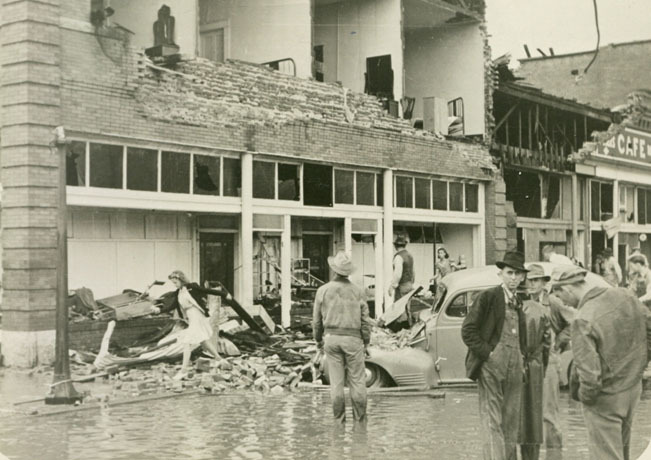 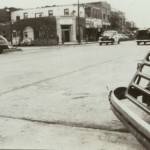 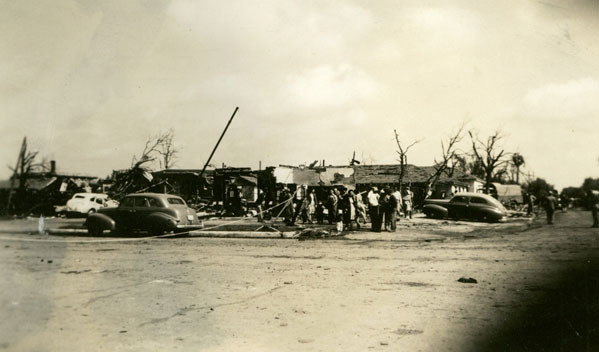 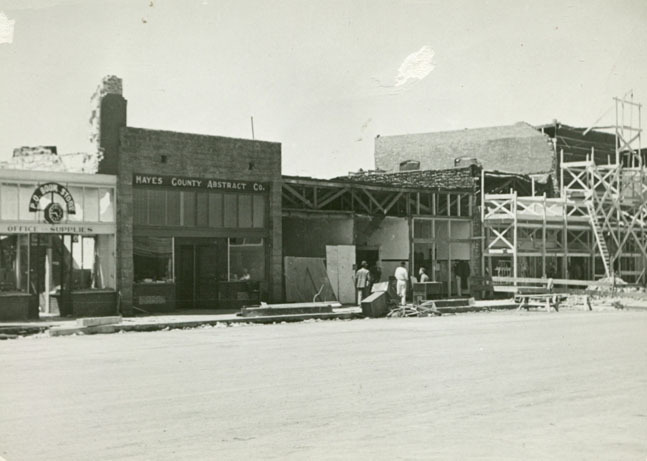 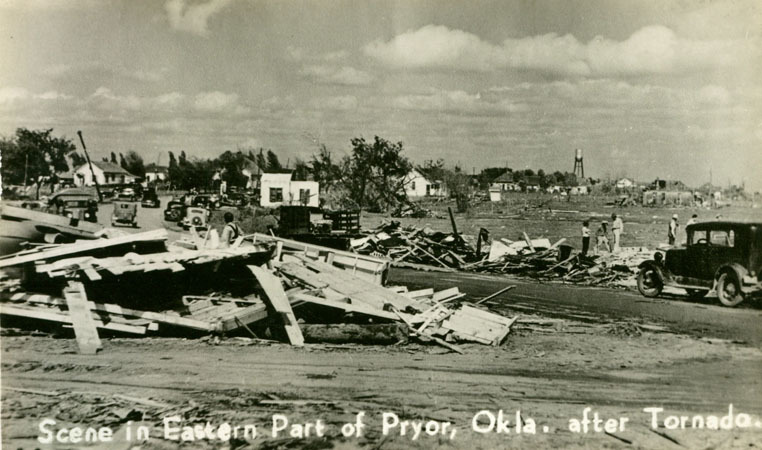 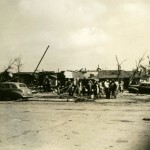 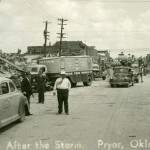 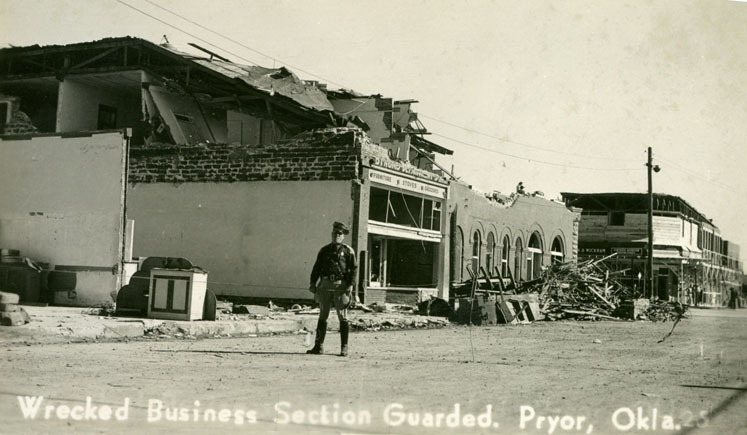 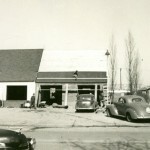 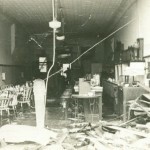 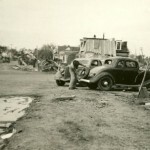 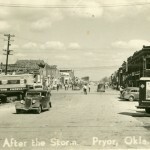 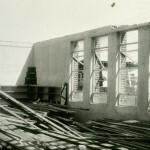 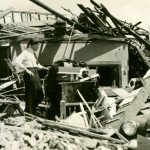 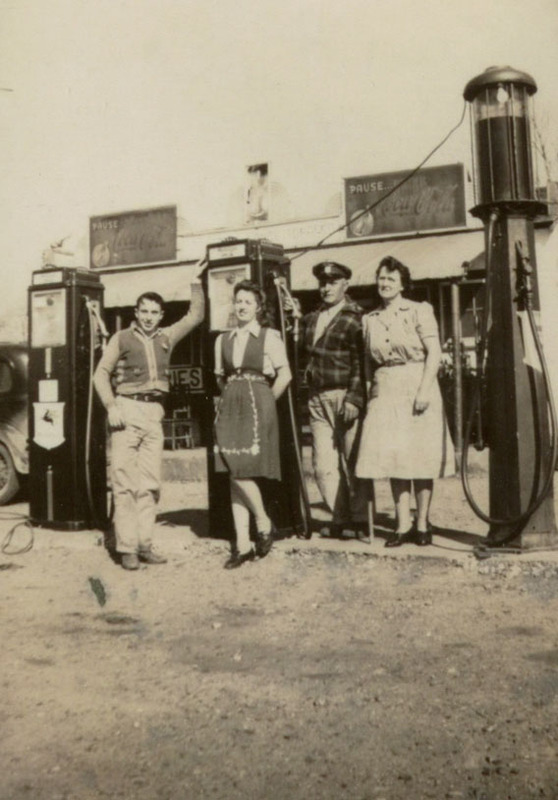 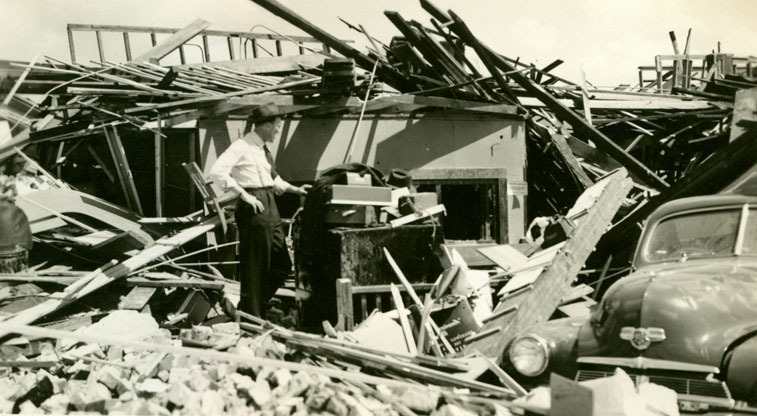 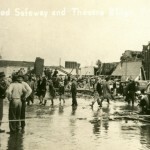 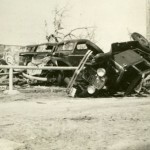 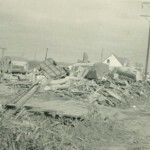 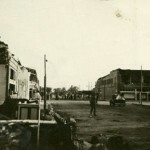 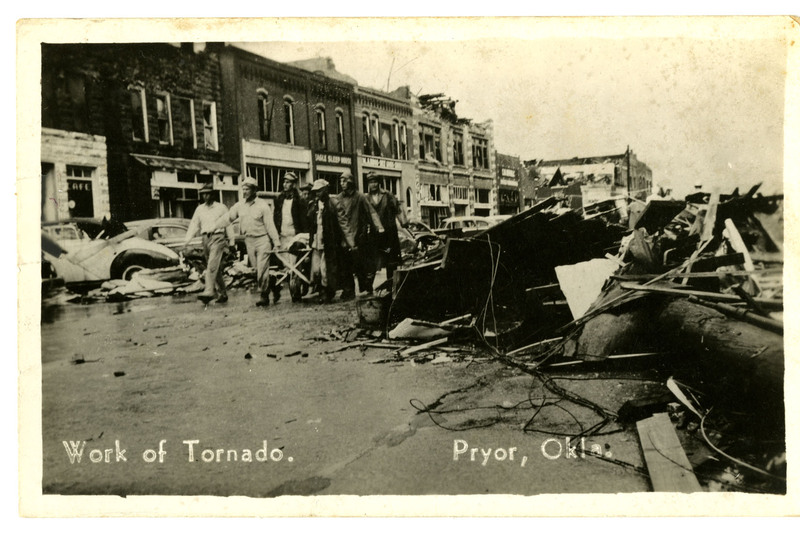 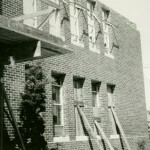 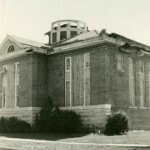 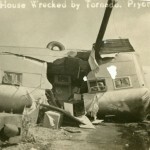 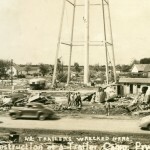 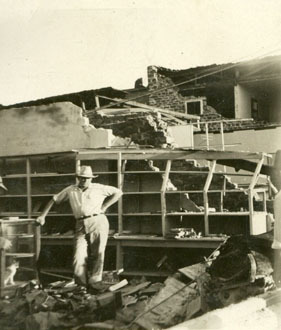 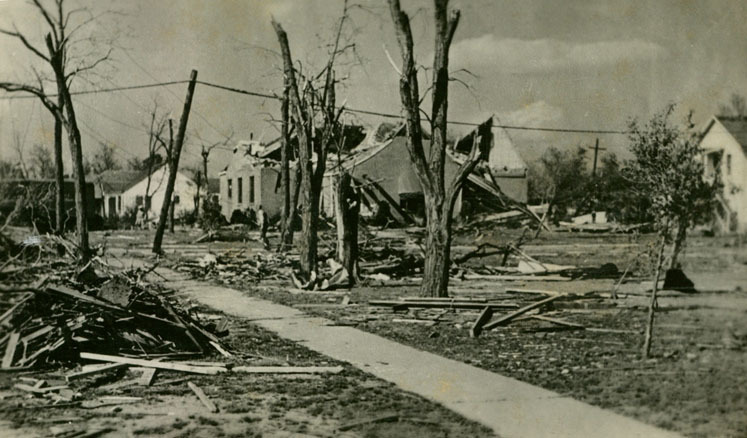 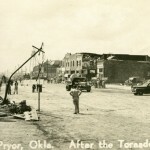 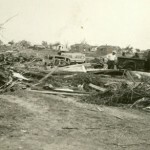 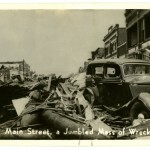 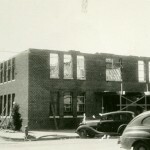 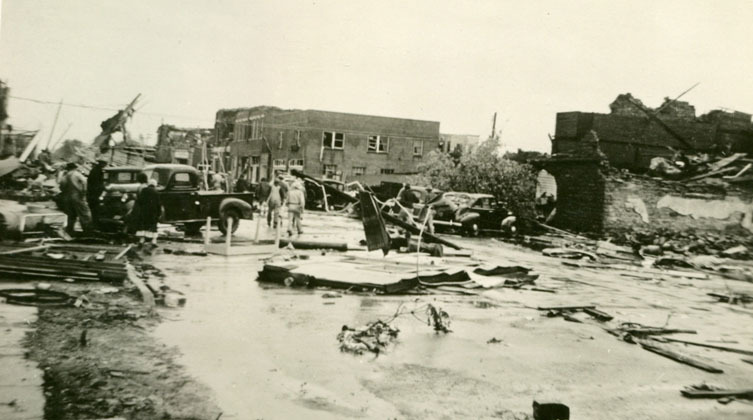 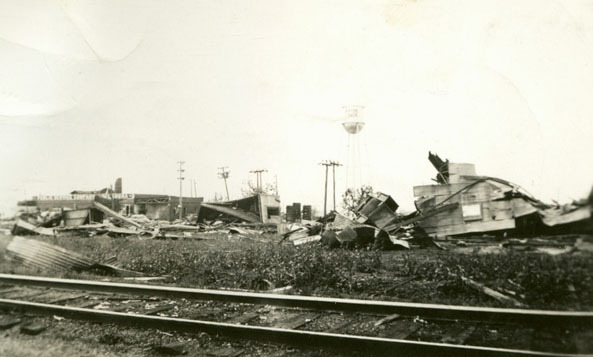 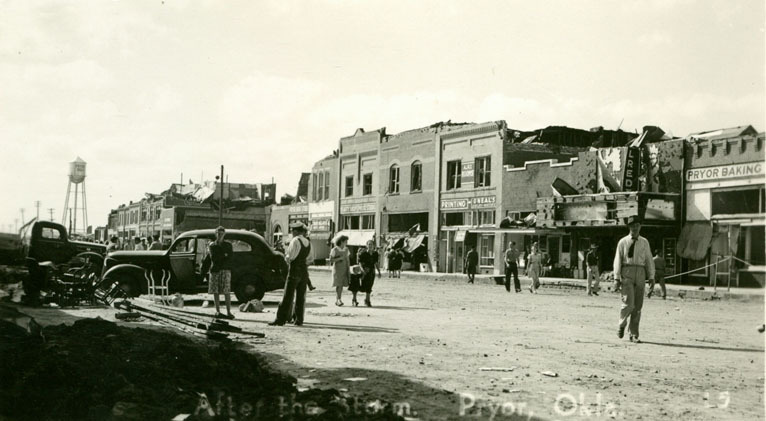 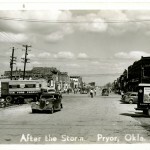 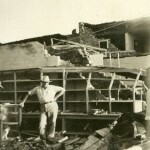 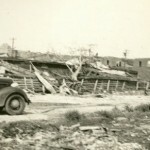 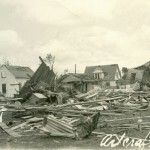 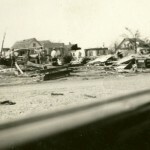 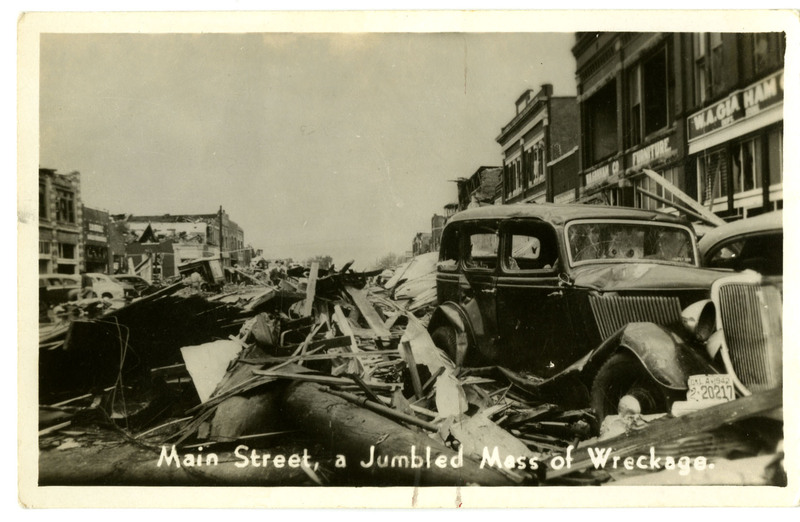 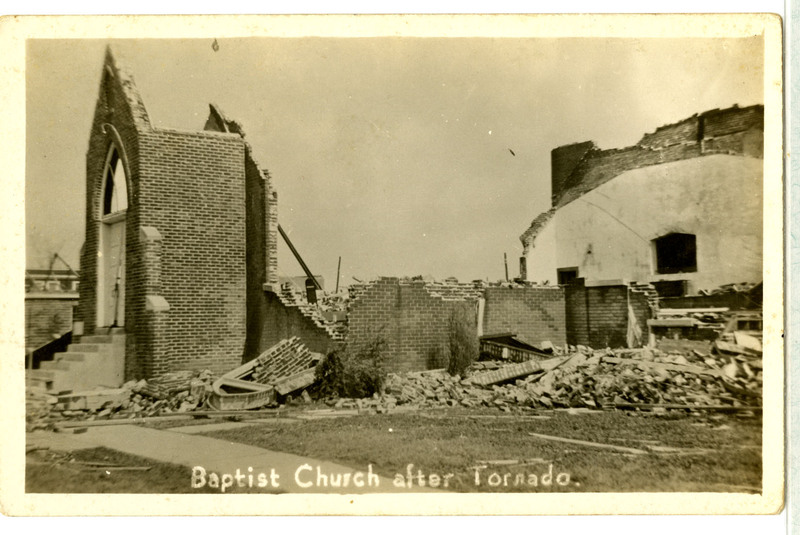 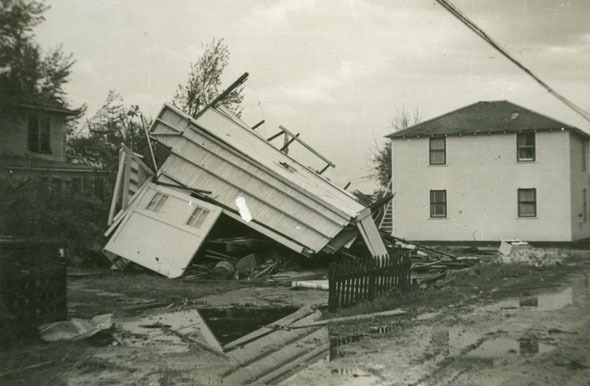 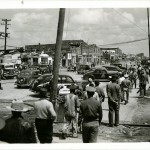 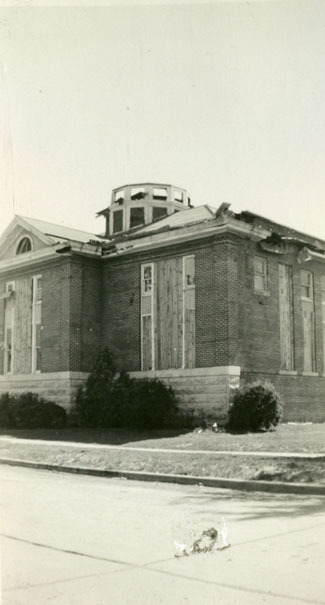 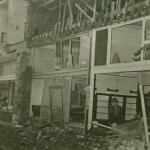 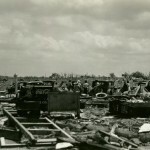 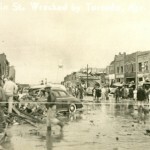 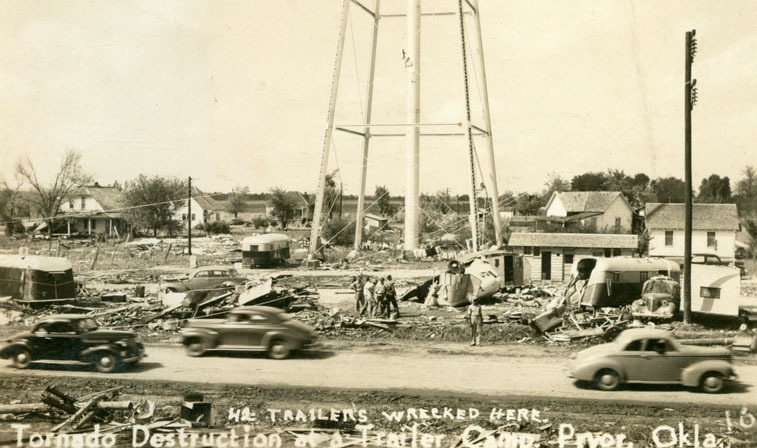 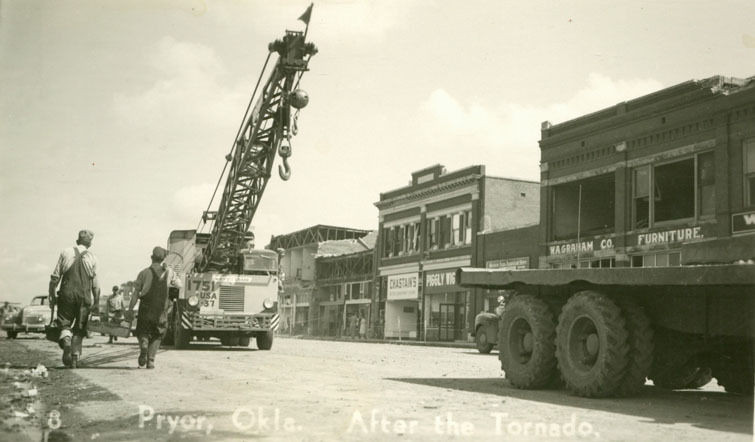 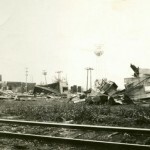 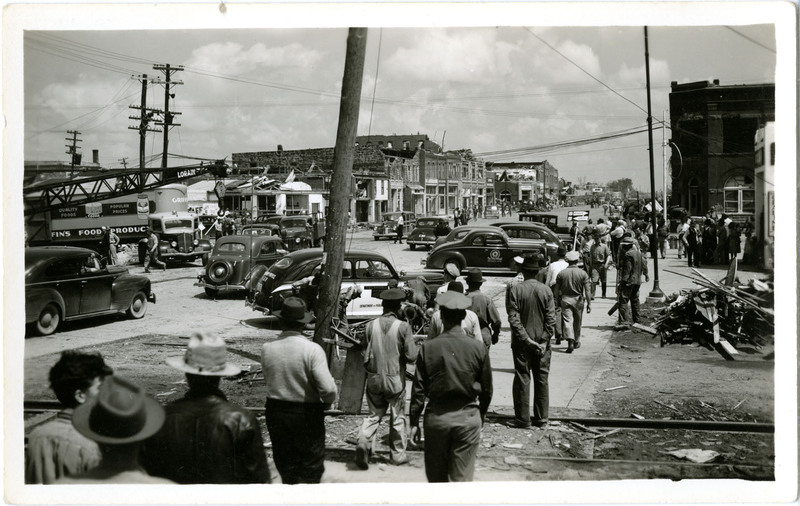 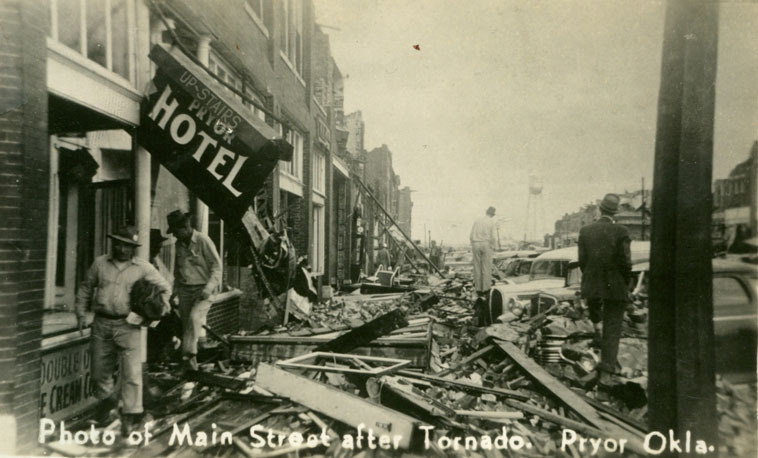 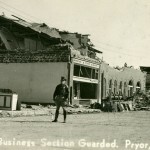 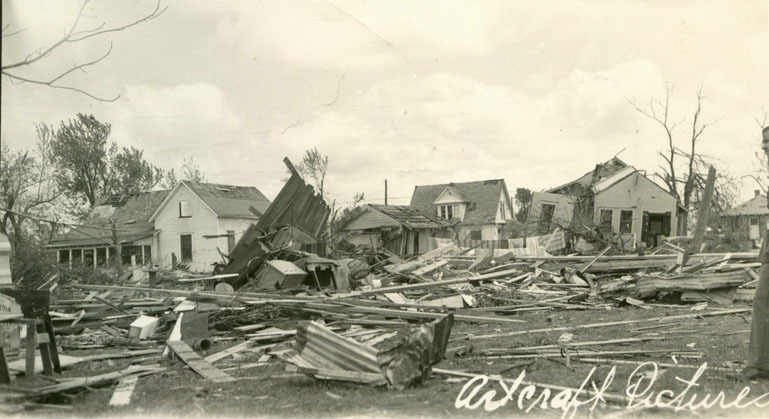 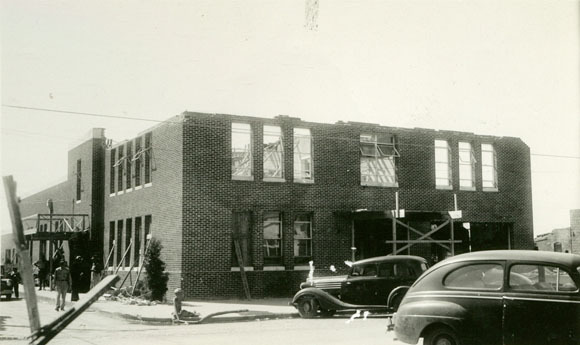 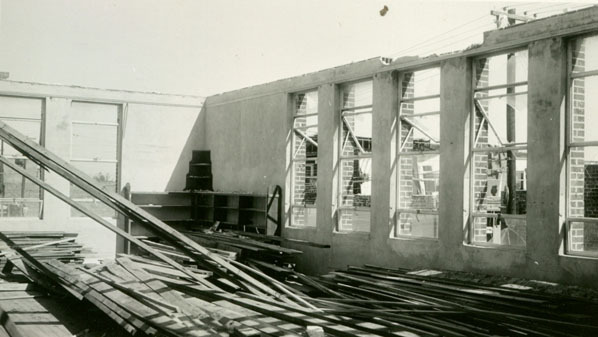 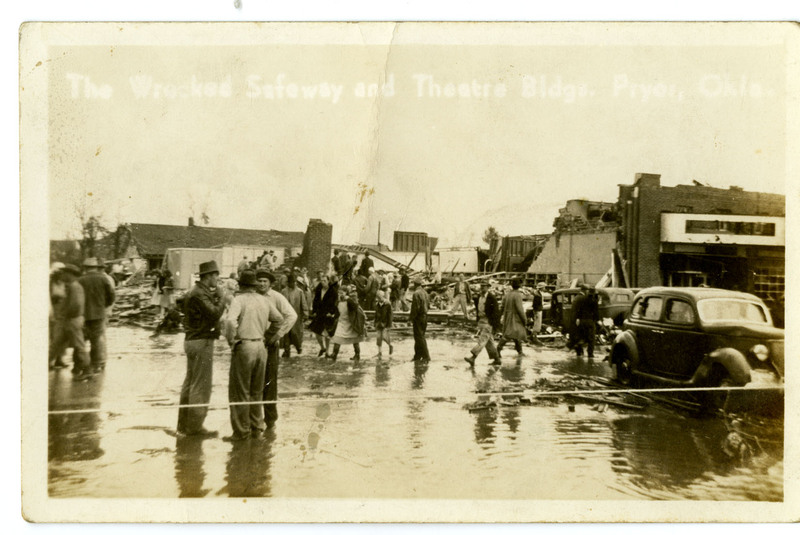 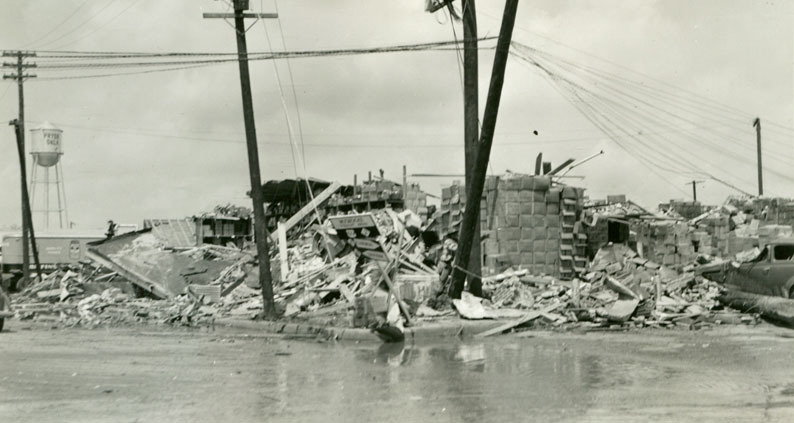 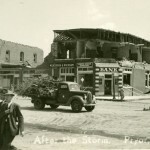 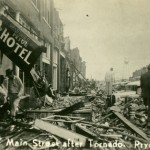 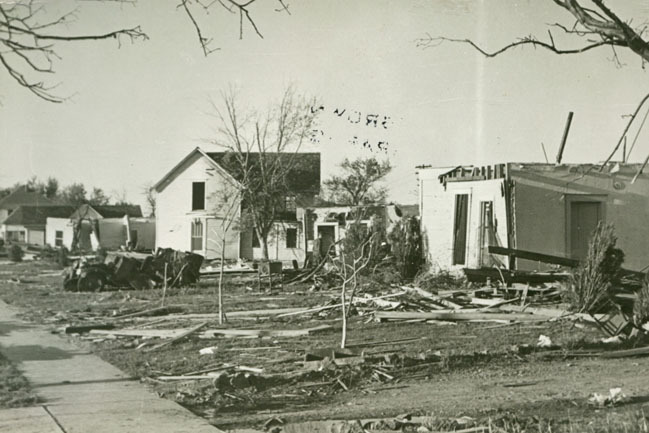 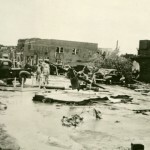 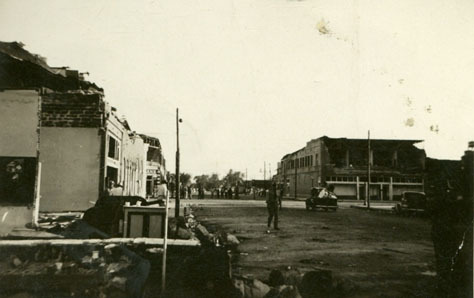 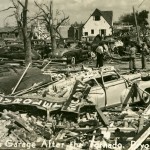 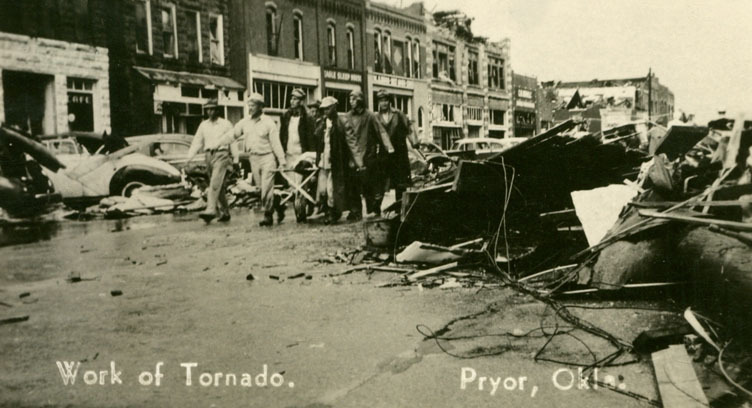 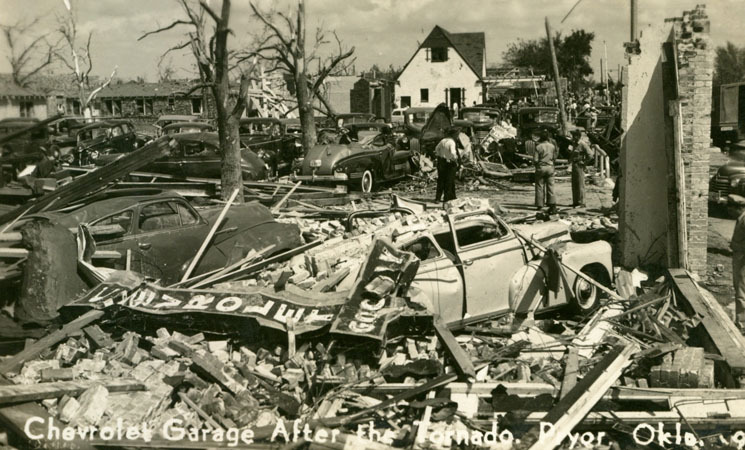 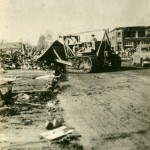 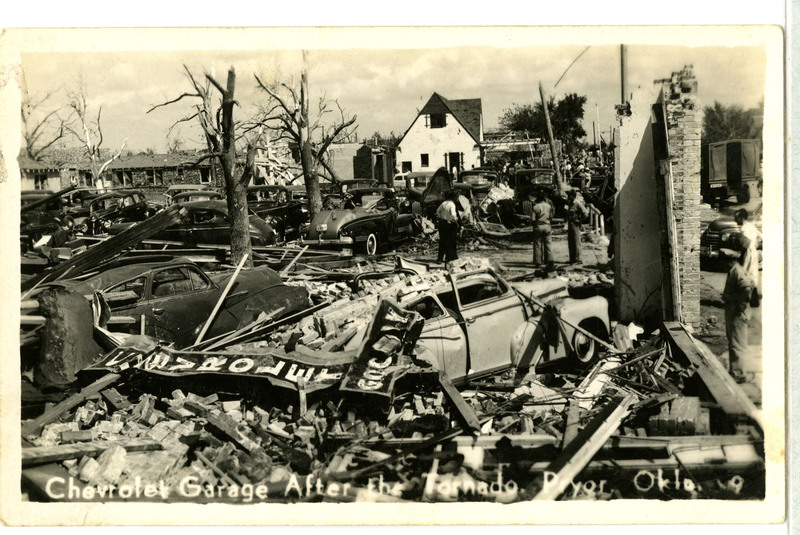 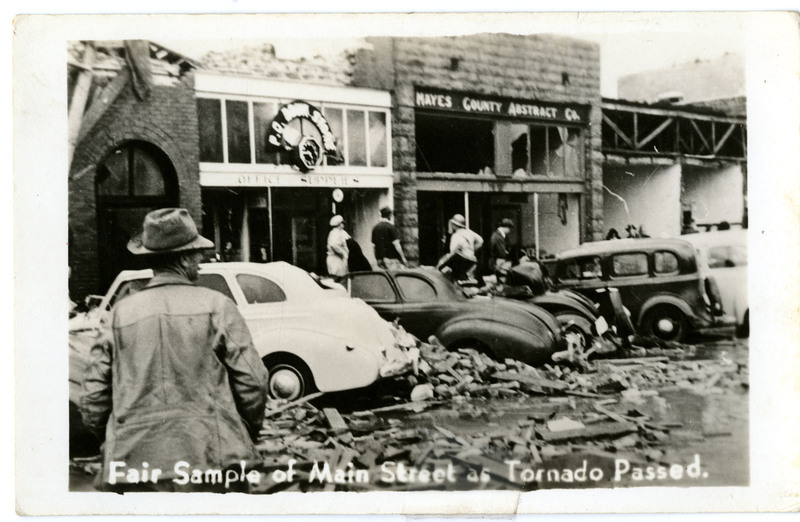 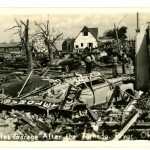 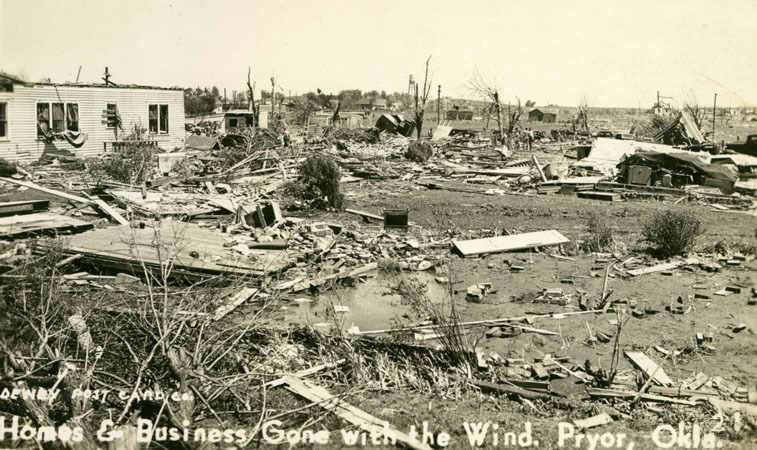 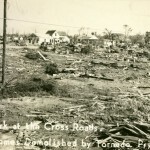 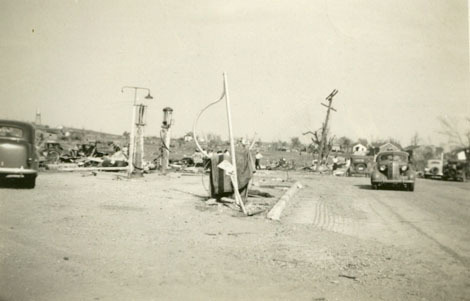 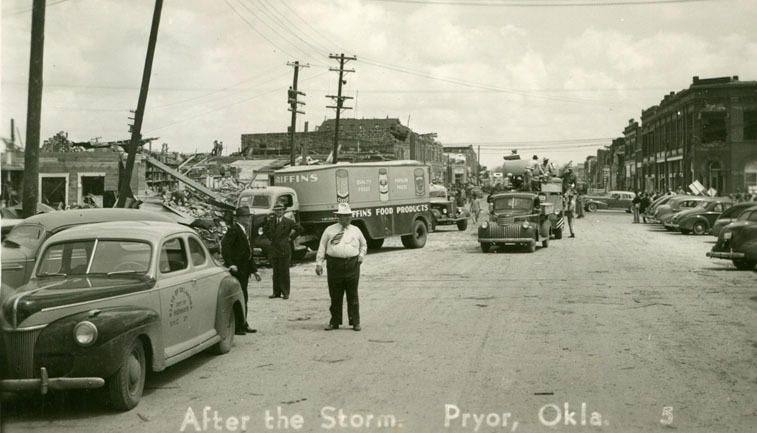 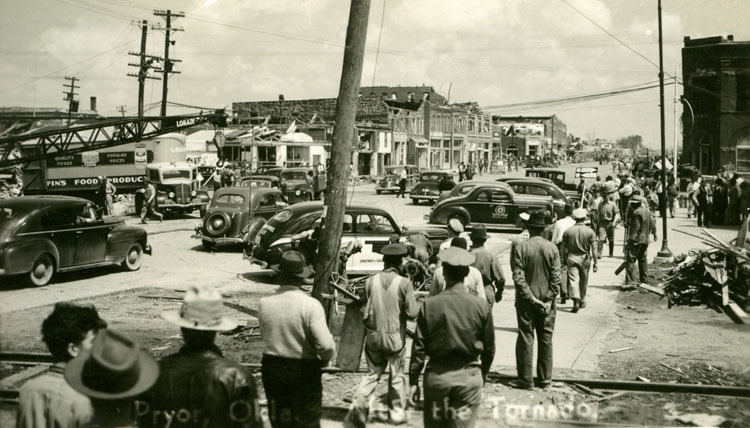 On April 27, 1942, while the world was caught up in World War II, a tornado swept along Pryor Creek’s main street from the western edge of the business district to the eastern edge of the city, destroying nearly every building and causing extensive damage to the residential section. 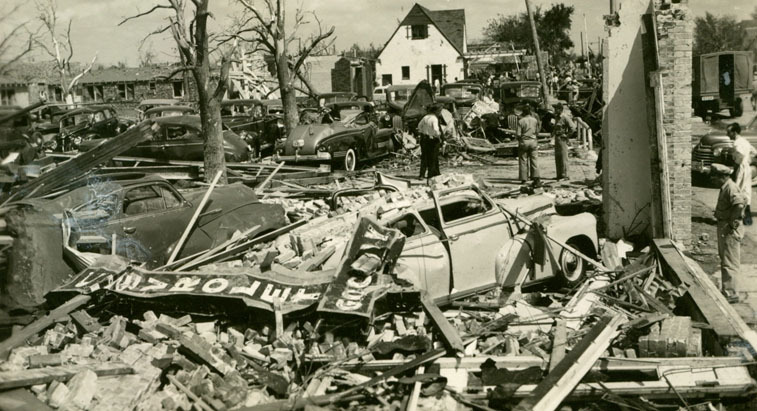 The storm killed 52 people, according to the U.S. 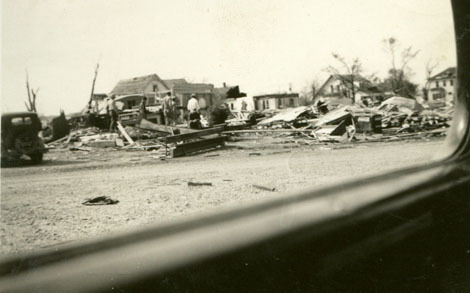 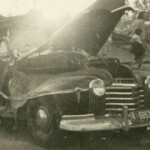 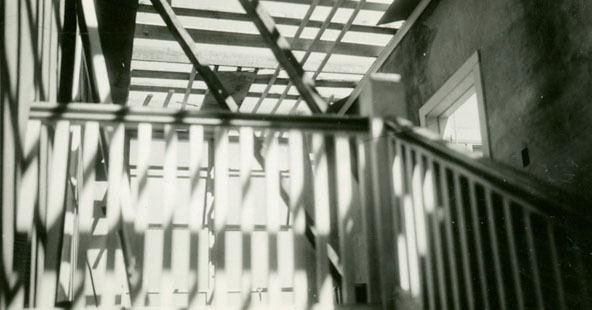 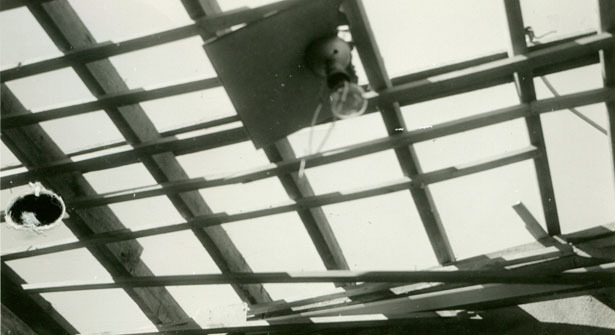 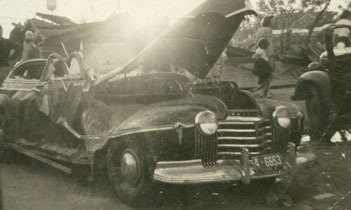 Weather Bureau, but The Associated Press set the total at 60 two days after the storm. 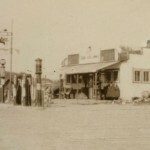 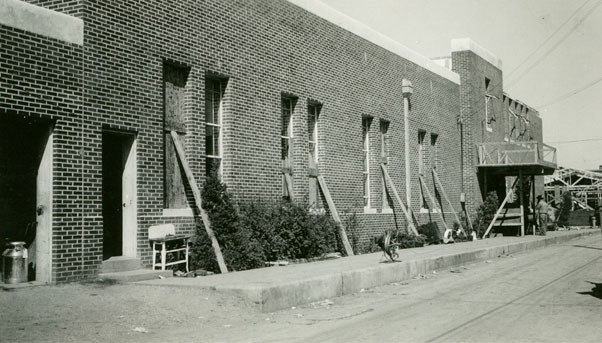 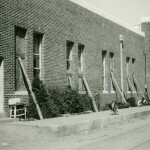 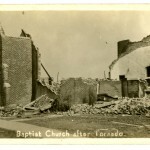 Many more – around 400 – were injured, and churches and other local buildings were pressed into service as makeshift hospitals. 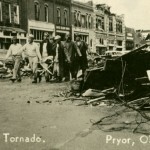 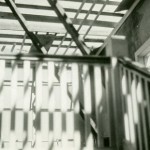 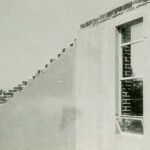 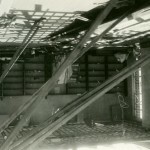 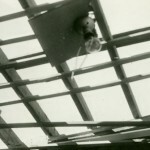 Destruction caused by the tornado. 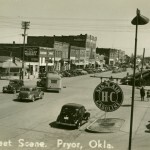 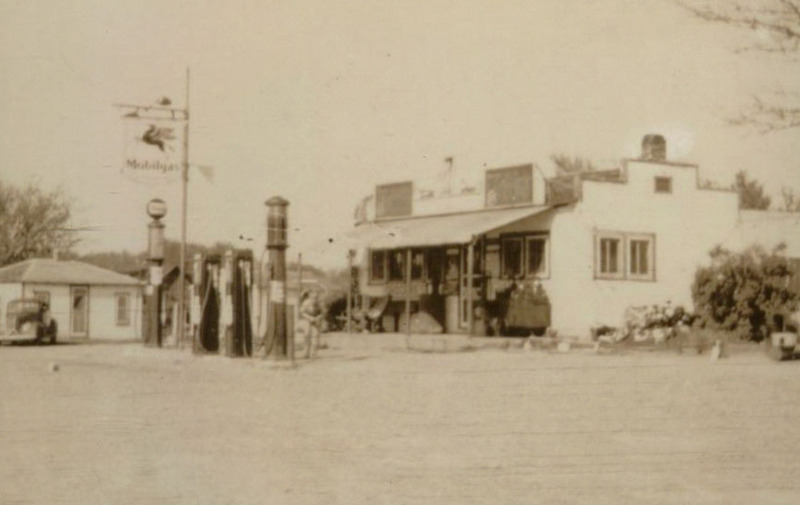 Intersection of Highway 69 and Highway 20.